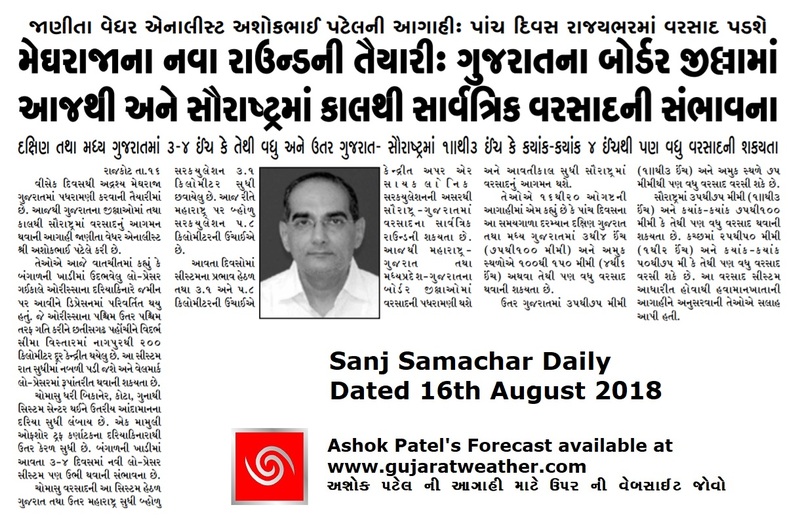 Note: Unless there is drastic change in the forecast outcome the forecast dated 15th August and newspaper forecast dated 16th August 2018 published here is yet valid and will be reviewed tomorrow evening. નોંધ: 15 ઓગસ્ટ ની આગાહી તેમજ 16 ઓગસ્ટ ના અહીં આપેલ છાપા ની આગાહી થી વરસાદ ની માત્રા માં વધુ ફરક પડે એવું જણાય નહિ ત્યાં સુધી આ આગાહી યથાવત રહે છે. 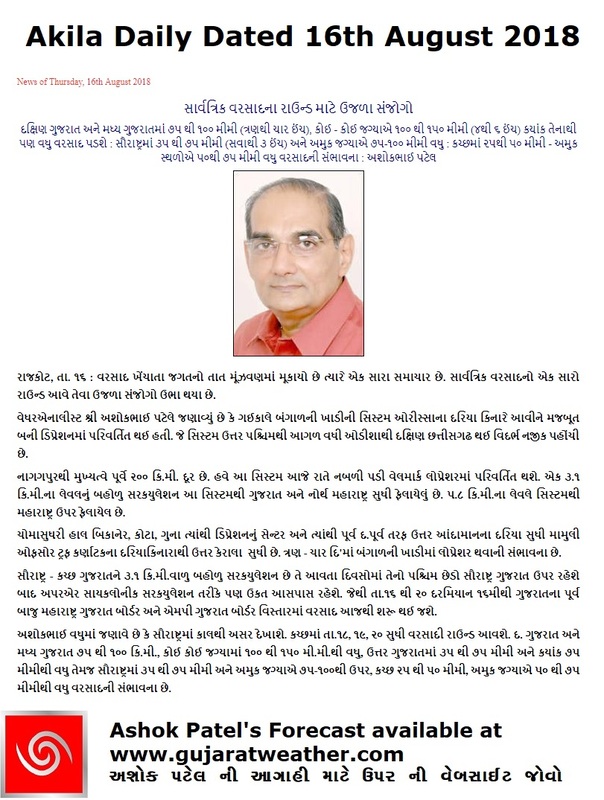 કોઈ પણ ફેર ફાર માટે આવતી કાલ સાંજે મુલવણી થશે. The System now lies as a Low Pressure over Northwest Madhya Pradesh and adjoining Southeast Rajasthan. 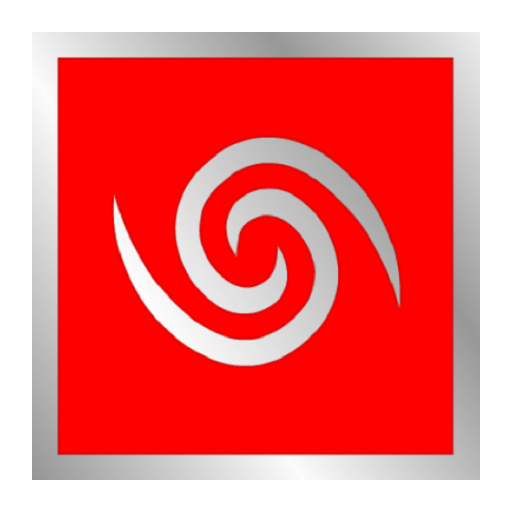 The UAC associated is extends up to 5.8 km above mean sea level tilting Southwards with height. Axis of Monsoon runs from Jaisalmer to above Low Pressure, Akola, Chandbali and towards Northeast Bay of Bengal. An East­ West shear zone at 3.1 above mean sea level runs roughly along Latitude 21.5°N across Central India. An East West shear zone at 5.8 km above mean sea level runs roughly along Latitude 20°N across Central India. સિસ્ટમ હવે લો પ્રેસર છે જે નોર્થવેસ્ટ એમપી અને દક્ષિણ પૂર્વ રાજસ્થાન પર છે. તેના અનૂસંગિક યુએસી વધતી ઉંચાઇએ દક્ષિણ તરફ ઝુકે છે. ચોમાસુ ધરી જેસલમેર, નોર્થવેસ્ટ એમપી અને દક્ષિણ પૂર્વ રાજસ્થાન નું લો પ્રેસર, અકોલા, ચાંદબલી અને ત્યાંથી નોર્થઇસ્ટ બંગાળ ની ખાડી તરફ લંબાય છે. Latitude 21.5°N પર એક બહોળું અપર એર સાયક્લોનિક સર્ક્યુલેશન 3.1 કિમિ પર સૌરાષ્ટ્ર ગુજરાત બાજુ થી સેન્ટ્રલ ઇન્ડિયા બાજુ છવાયેલ છે. Latitude 20°N પર એક બહોળું અપર એર સાયક્લોનિક સર્ક્યુલેશન 5.8 કિમિ પર સૌરાષ્ટ્ર લાગુ અરબી સમુદ્ર/ગુજરાત બાજુ થી સેન્ટ્રલ ઇન્ડિયા બાજુ છવાયેલ છે. The Depression weakened into a Well Marked Low Pressure area and lies over Southwest Madhya Pradesh & neighborhood. Associated Cyclonic Circulation extends upto 5.8 km above mean sea level tilting Southwards with height. The Axis of Monsoon trough at mean sea level now passes through Jaisalmer, Deesa, Center of Well Marked Low Pressure area over Southwest Madhya Pradesh & neighborhood, Akola, Rajnandgaon, Jharsuguda , Chandbali and thence towards Northeast Bay of Bengal. The feeble off shore trough at mean sea level off Karnataka to North Kerala coasts persists. A low pressure area is likely to develop over North Bay of Bengal and neighborhood around 18th/19th August. The cyclonic circulation over northeast Afghanistan & neighborhood persists and now seen at 5.8 km above mean sea level with a trough aloft runs roughly along Long. 68° E and north of Lat. 28°N. ડિપ્રેસન હવે નબળું પડી વેલ માર્કંડ થયું દક્ષિણ પશ્ચિમ એમપી અને આસપાસ ના વિસ્તાર માં. તેના અનૂસંગિક યુએસી વધતી ઉંચાઇએ દક્ષિણ તરફ ઝુકે છે. ચોમાસુ ધરી જેસલમેર, ડીસા, દક્ષિણ પશ્ચિમ એમપી નું વેલમાર્કડ લો પ્રેસર થઇ ને અકોલા, ચાંદબલી અને ત્યાંથી નોર્થઇસ્ટ બંગાળ ની ખાડી તરફ લંબાય છે. સામાન્ય ઑફ શોર ટ્રફ કર્ણાટક થી નોર્થ કેરળ સુધી છે. બંગાળ ની ખાડી માં નવું લો પ્રેસર ટૂંક ટાઈમ માં થવાની શક્યતા છે. The Depression over Vidarbha & neighborhood moved West ­northwestwards during past 06 hours and lay centered at 0530 hrs IST of today, the 17th August, 2018 over Southwest Madhya Pradesh and adjoining Gujarat & North Madhya Maharashtra near Lat. 21.8°N and Long. 75.8°E, about 270 Km East­southeast of Baroda (Gujarat). It is very likely to move West ­Northwestwards and weaken gradually into a Well Marked Low Pressure area during next 12 hours. The Axis of Monsoon trough at mean sea level now passes through Bhuj, Center of Depression over Southwest Madhya Pradesh and adjoining Gujarat & North Madhya Maharashtra, Nagpur, Durg, Gopalpur and thence towards north Andaman Sea. A Low Pressure area is likely to develop over Coastal Bay of Bengal and neighborhood around 18th August. નીચે આપેલ 2 પાના નું ડોક્યુમેન્ટ છે. પેજ અપ અને પેજ ડાઉન કરવા માટે પાના માં ડાબી બાજુ નીચે એરો ક્લિક કરો. Here below is a 2 page Document. Click Page Up Down arrows at the bottom left corner on the Document page to read all the pages. ડિપ્રેસન હાલ દક્ષિણ પશ્ચિમ મધ્ય પ્રદેશ, નોર્થ મધ્ય મહારાષ્ટ્ર અને લાગુ ગુજરાત બોર્ડર વિસ્તાર માં છે. સિસ્ટમ ટ્રેક હાલ પશ્ચિમ ઉત્તર પશ્ચિમ જે ગુજરાત તરફ છે. ચોમાસુ ધરી ભુજ થી ડિપ્રેસન સેન્ટર, નાગપુર, ગોપાલપુર થઇ ને નોર્થ આંદામાન દરિયા તરફ લંબાય છે. Ashok sir e aaj sanj Ni updet ma chokhu lakhelu Che ke aagahi aagal mujab samjavi Ane kai ferfar thase to aavti kaale saanje update aapse.etle bhaiyo khotu aahak karoma. Negative comment karanarao thodi dhiraj rakho ane 18 & 19 tarikh ni kamal juo…..
Vanchvani mahenat na levi hoy toe thyu !! Saurashtra maate aagahi na 12 kalak thay toe pan puru thayi gayu…. ? Ahi aavata badha Mitro aagahi kar thai gaya chhe !! Sir, hu vadad no samuh kya chhe ae nthi joto pan system/uac na location par najar karu chhu. Te mujab saurastra mate hajuye saru j vatavaran chhe.right sir? Bahodu circulation 3.1 km and 5.8 km varu chhe jeno Pashchim chhedo Saurashtra, Gujarat and Kutch najik chhe. Low thi border vistar ne haju labh maley. Sir varasad no round puro thayo? Satelite image jota aevu lage ce system uattar baju sarki gai… have uac na lidhe saurastra ma Shakyta ce?